If your Mom's only wish this Mother's Day is a way to lose those last stubborn pounds, then I have the perfect gift idea! This year, help mom get fit, healthy and happy for Mother's Day with the BodyMedia LINK Armband. The BodyMedia LINK Armband is a body-monitoring device with patented multi-sensor armband. It provides continuous body monitoring tracking physical activity levels, calories and sleep patterns - and a built in "personal trainer" that will keep you going to reach your physical activity goals. The armband records over 5,000 data points per minute and wraps the data up into a nice Smartphone app (available for iPhone or Android) that shows real-time activity levels. I have seen and tried several body monitoring systems before but this is definitely one of the best out there because achieving your health and weight loss goals is a 24/7 commitment and this system monitors your body around the clock...even while you sleep! You have targets to reach every day. Because BodyMedia FIT is in contact with your body day and night, it knows where you stand with these targets at any given moment. Armed with accurate information, you have the power to make good decisions. So you know whether you need to spend an extra 10 minutes on the treadmill, or if you can have an end-of-day snack and still reach your goal for the day. With its patented multi-sensor Armband, BodyMedia FIT automatically tracks calories burned during exercise and monitors exercise intensity, telling you how much time you spend in moderate and vigorous activity. This helps you improve your overall fitness. Learning when you can increase activity levels helps you create an exercise and fitness plan that realistically works for you by helping you meet your fitness goals. So how do you wear it and record your info? You wear it as a armband and the armband works as a fitness monitor to measure the intensity of your workouts and also monitors the quality of your sleep, an important factor in weight loss. The information tracked can easily be managed with BodyMedia's online Activity Manager. Just add in the easy-to-use food log and you have the right information to improve your weight loss. Upload your data to your computer where the online Activity Manager (subscription required) analyzes raw data, allows you to log food and presents info in an easy-to-understand way so you can track your progress. The BodyMedia FIT Activity Manager, their exclusive online tool, helps you learn about your individual calorie intake, personal sleep information and the intensity of your workouts. 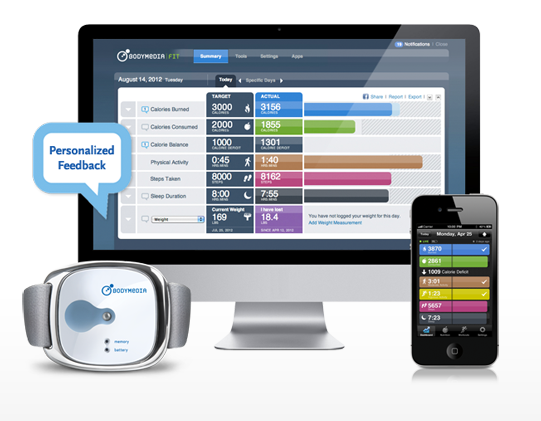 By analyzing that data, you can manage and track fitness and weight loss progress. The system allows you to enter your personal body parameters, provides you with FIT coach feedback, and guides you to your goals. Then you will have a running report on progress toward goals, including calorie burn, steps taken, time spent in moderate and vigorous activity, nutritional analysis and sleep efficiency - all while tracking your personal bests. The Armband does not display information on its own; rather it works in conjunction with the online Activity Manager. So lose those last couple of stubborn pounds with the BodyMedia LINK Armband! It isn't just a calorie tracker, weight loss calculator or exercise monitor. The unique design and sensitive sensors work together to make it a complete on body monitor that helps you stay on track with your personal weight loss plan and exercise programs! Buy It: You can purchase the BodyMedia LINK Armband ON SALE NOW for $119.20 from BodyMedia's website. Win It: BodyMedia is generously offering (1) CORE Armband to a lucky winner!